In just a few days it will be the winter solstice, the longest day of the night. This year I reviewed two delightful books about this special time of year, The longest night and Snow Party. My reviews are below. The crow, the moose, and the fox are all sure that one of them will be able to bring back the sun so that light and warmth will come to the land once more. The wind knows better though. The wind knows that someone else, someone small and unassuming, will be the one to call the sun back. 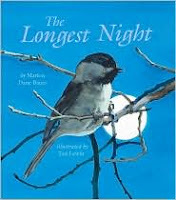 With a lyrical text and Ted Lewin’s beautiful paintings, this picture book about the longest night of the year is a joy to read. It snowed all night long, and in the morning, everything is covered with “beautiful snow.” Out of the snowy landscape come snow men, snow women, and snow children. Each one of them carries a bag or a box. Happily they set up tables, string lights, and prepare for a “special party.” The little snow children look at a large wrapped gift, wondering what might be inside the colorful wrapped package. At long last all is ready. The tables are set, the food is ready, the musicians have arrived, and on this shortest day of the year, the winter solstice, the snow people begin their wonderful snow party. In this special seasonal title, Harriet Ziefert’s simple text is beautifully complimented by Mark Jones’ lovely illustrations. After reading this book young readers will be keen to have a snow party of their own, complete with icy treats, glowing lamps, and festive cheer. Long ago people did not know what made some months colder than others. They did not know why the sun would hang so low in the sky in the winter and why the days grew so short. They would grow afraid that the sun would disappear all together and that they would all die of cold and starvation. And so, in an effort to protect themselves from the evil spirits that they were sure lurked in the darkness and to make sure that the sun would return, they held special ceremonies and rituals. In some cultures sacrifices would be made to appease the gods. Over the centuries people have held all kinds of celebrations on or around the winter solstice. Gifts were exchanged, special foods were eaten, bonfires were lit, and unique ceremonies arose. Today we know why winter is a colder season and are not frightened by it. We don’t usually have special ceremonies on the winter solstice any more but many of the traditions that used to be held on the solstice are now ones that we enjoy on Christmas or Hanukkah. 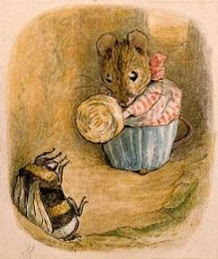 Just like the Romans during their solstice celebrations we light candles, exchange gifts, and eat special foods. Like the people of Northern Europe we decorate our homes with evergreen and mistletoe. 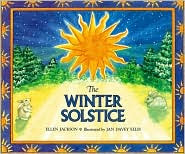 As they read this book children will be interested to discover that so many of the traditions of their holiday season come from very ancient winter solstice traditions. The author looks at winter solstice ceremonies and rituals from around the world and she ends her narrative with a Cherokee solstice story. Carefully researched and beautifully illustrated, this is a picture book which provides its readers with a wealth of information. You can find more winter books on the Winter Days feature on the TTLG website. Happy winter solstice everyone! Two wonderful gift idea titles. On this day...Rosa Parks takes a stand.